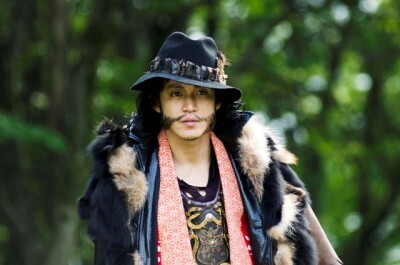 First teaser pictures revealed of Oguri Shun's guest appearance in "Yuusha Yoshihiko"
It's been known for a while that actor Oguri Shun would be making a guest appearance in TV Tokyo's low-budget drama, "Yuusha Yoshihiko to Maou no Shiro", where he'll support his friend Yamada Takayuki on his hilarious and spectacular adventure. Details about his role were scant, but now TV Tokyo has finally opened up with their first teaser photos of Oguri's character, 'Bacchus'! Appearing in the 10th episode, 'Bacchus' will pose as the biggest enemy for 'Yoshihiko' (Yamada) and his party before they reach the magic castle. One may not realize the far-reaching consequences of Oguri playing such a role, but Yamada gladly quoted his friend during an 'off-meeting' that happened on August 5th. He said, "Shun-kun told me that this role is going to be his gateway towards a much greater variety of roles for him in the future." Interestingly enough, Oguri and Yamada are also working together in another drama this season. In the surreal series, "Arakawa Under the Bridge", Oguri plays a village headman disguised as a 'kappa', while Yamada portrays the 'star' of a self-proclaimed former popular musician. The 10th episode of "Yuusha Yoshihiko to Maou no Shiro" will air on September 9th. Kutsuna Shiori to play Ueno Juri & Mukai Osamu's daughter in "Gou"